Sign up for the waiting list at www. qmxonline.com. Preordering will start in Q1 2013. For Doctor Who collectors who demand absolute authenticity, QMx is proud to offer a very limited edition of River Song’s Sonic Screwdriver, as part of the QMx Artisan Master Series. This special edition of the Sonic Screwdriver has been handmade for QMx by Doctor Who Prop Maker Nick Robatto, who is based in Cardiff, Wales. Like the prop seen on-screen, this sonic screwdriver lights up at the tip. And behind a removable cover there’s the neural relay which flashes to indicate the life force left in River Song. River claims this antique-looking sonic screwdriver was a gift from the Doctor in an encounter he has no memory of, because her timeline runs contrary to his. Wibbly wobbly, timey-wimey stuff, indeed! Is made entirely by hand by Mr. Robatto himself. Most of the parts were machined by hand — none were CNC’d; it is constructed exactly like the screen-used hero prop. Consists of approximately 70 components, most of them made of aluminum, brass, resin, nylon and polymethyl methacrylate. Features a crackle paint similar to that used on the 10th’s Doctor’s Sonic. However, the crackle is a bit larger and the color deeper and darker to reflect the age of River Song’s Sonic. Takes two weeks to assemble. Contains no found objects, with the exception of screws and electronic components. All other parts are handmade. Measures about 6.89 inches (175 mm) long. “The River Song Sonic is probably my favorite sonic to make,” says Nick. He considers himself very lucky to have had the job of bringing the sonics to life for the Doctor Who series, where he has been the prop maker since the show rebooted in 2005. “It’s an enjoyable piece to make and the overall finish of this sonic is very pleasing,” Nick adds. He credits Doctor Who Concept Artist Peter Mckinstry for the “great design” down to the little details. “I especially like the added verdigris which gives the sonic a life and history behind it,” says Nick. He advises owners of this hero prop to handle it firmly but gently, and to clean it with a soft, dry cloth. Each River Song’s Sonic Screwdriver – Artisan Master Series comes nestled in a River Song diary prop replica. On the inside cover is a certificate of authenticity with the edition number and Nick Robatto’s signature. 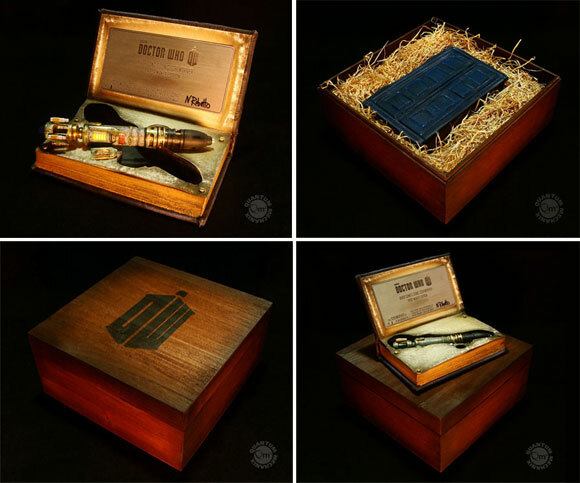 The sonic and diary come packaged in a handmade wooden chest that features the Doctor Who logo. Only 15 of these very special Master Series River Song Sonic Screwdrivers made personally by Nick Robatto will be available for sale. It’s a rare opportunity to own this absolutely authentic piece of Gallifreyan technology. Offered at $3,499.95. I want one! How much can I get it for! Where can I get one! WOW! If you buy the S6 Boxset you see part of their last meeting in the extra mini eps. Hi booboo do you know when QMX are making that 11th doctors screwdriver replica we talk about ages ago? it also said on there website they are making one at a later date? You have to make it?! Or is it already done for you? I love the way the screwdriver is presented in the box with the straw, but i dont think price wise it is a very good buy, it looks very expensive. This is ridiculously expensive! I mean, whod get it? What if it breaks? Well, anyway, thats just my opinion. Im sure most of you have different opinions. It’s a trap! I cannot handle money of this magnitude! Too expensive! Well, if you have $3500, then it is yours! Expensive (As it would be for the sheer quality behind it) & as much as I would like one it’s for rich Whovians only. At 15 pieces this is a true collectable! I like how the box is her book. I really want to see how she get’s the screwdriver, and how the Doctor get’s it actually. I ever understood that bit. crying for a lost love could that be amy because it could be in series 7 part two because i know he gets over them whe he meets “osra” clara oswin but it might be like their wedding or some thing. I know how she get’s it, I want to SEE it, on the TV. @ Mr Sec – how did you know he was crying for a lost love and said that line? That was never mentioned in Silence in the Library/Forest of the Dead?